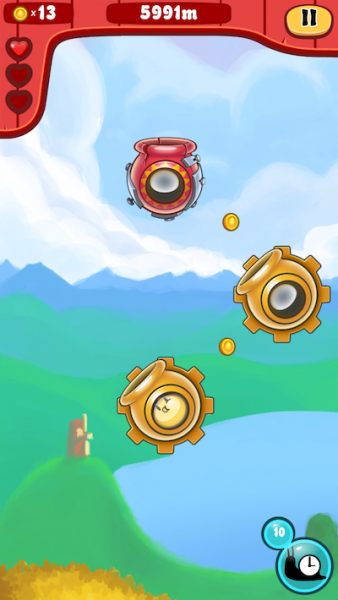 Chick-A-Boom - Mega Cannon Adventure to Skyland (Free) by Tapps Tecnologia da Informação Ltda. is about a little chicken named Chickarus, and he desperately wants to fly. Now, I hate breaking bad news, but chickens aren’t capable of flying long distances. They might be able to flutter over a fence or roost in a tree, but they won’t be migrating to Mexico anytime soon. Chickarus has a problem on his hands … I mean wings. To solve this conundrum, Chickarus has decided to blast himself as high as he can by using a series of cannons. At first, I thought, “Yeah, that’s a great idea. Put yourself into a machine that’s going to propel you forward by explosions. That couldn’t possibly go wrong.” Then, I remembered that cars work on exactly the same principle. Moving from cannon to cannon is what makes this a platformer game. Usually, there are, you know, platforms involved. You jump from one to another, trying to get as high as possible. Chick-A-Boom follows the same format. It just uses cannons instead of platforms. As you reach certain heights, you unlock new levels. 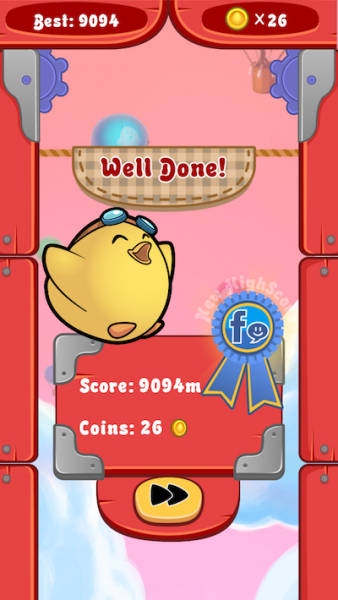 For example, the second level is unlocked when you reach 11,000 meters. 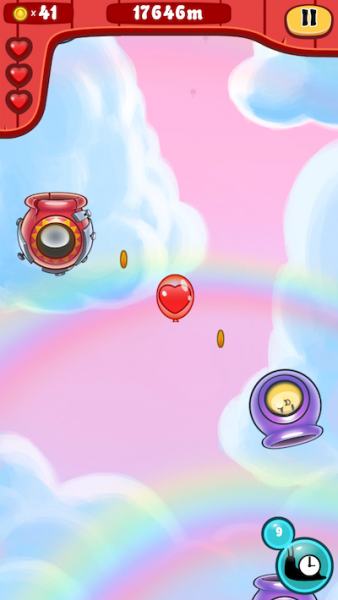 The third level unlocks at 25,000. There are five levels that you can unlock. These height requirements can be challenging. The first danger that comes to mind is missing a cannon. There are a variety of cannons that move in different ways. Some cannons even explode after you use them. However, there are other obstacles to consider. 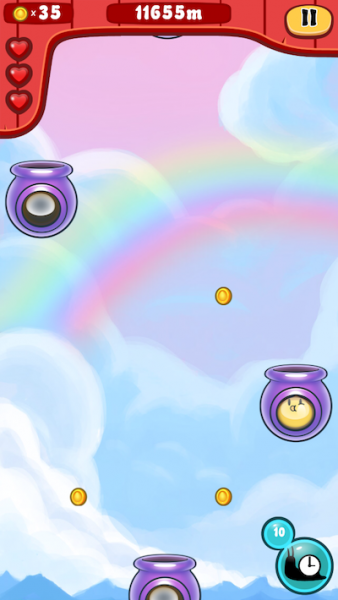 There are rainclouds that move back and forth in front of the cannons. You start the level with three hearts. Every time you hit something like a raincloud, you lose a heart. When you lose all three, it’s game over. There are ads in this game. 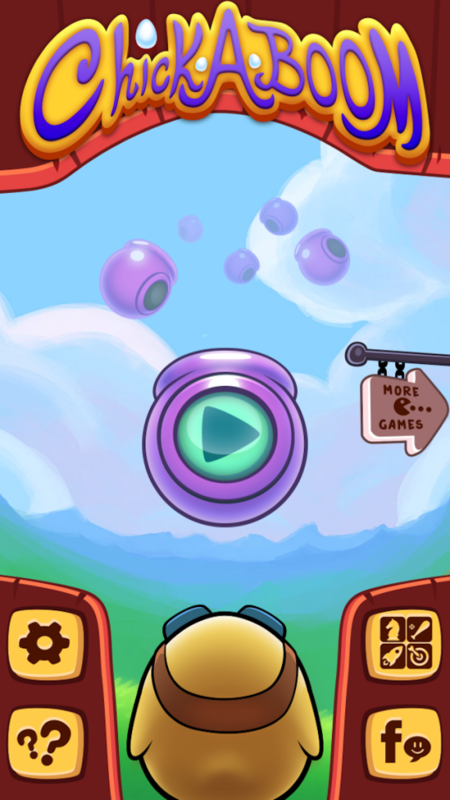 They pop up when you first open the game, but they don’t interfere while you play. You can remove the ads through an in-app purchase of $0.99. There are also several other in-app purchases. There are three different coin packages that range in price from $1.99 for 2,000 coins to $9.99 for 14,000 coins. There are also characters that you can purchase. There are three extra characters that range in price from $0.99 to $3.99. 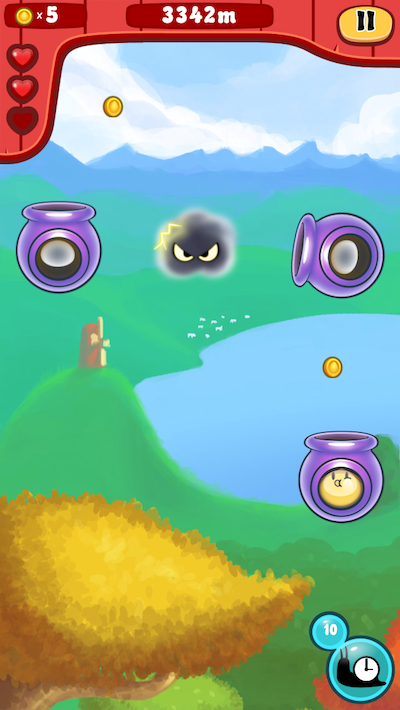 However, you can also unlock these characters by earning coins during gameplay. The problem is that coins are scarce. It would take a long time to earn enough coins. Luckily, the other characters don’t offer any bonuses for using them. There’s no need to unlock them. Aside from the large number of in-app purchases, this game was a lot of fun to play. It’s one that I’ll continue to play. 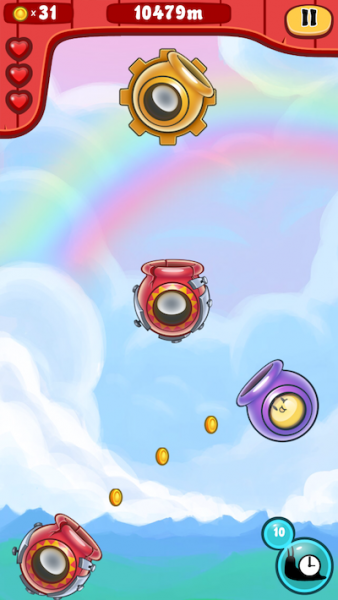 I loved aiming the cannons, and it was easy to work towards beating my high score. The graphics were great, and it’s a game that I would easily let my kids play. 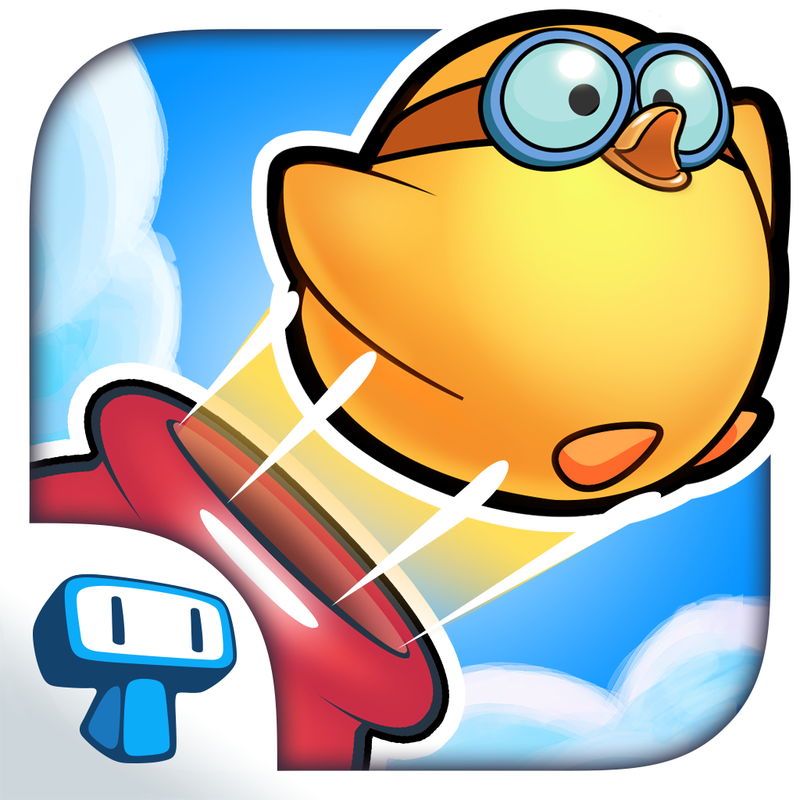 Chick-A-Boom is a universal app, and it’s available in the App Store for FREE!